Estr presta, L. mentha, Ar. dhamarān, na’na, Fr. menthe, MEng myntes, Eng. 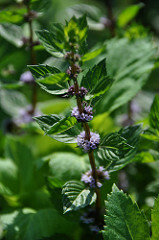 mint; menta (L. Mentha piperita), Eng peppermint; hierbabuena, OCast yerva buena (L. mentha sativa), Eng spearmint; mentastro (L. Mentha rotundifolia), Eng. apple mint. The former three are the most likely unidentified species referred to in medieval cuisine. While ancient Greek cooks added peppermint to wines and sauces and mint crowns were worn at feasts. Although Cato the Elder (234BC-149BC), Pliny the Elder (23AD-79 AD) and Martial (40AD-102AD) write about mint none of Apicius’ recipes call for it. Several species of mint like pennyroyal (Sp. poleo) are native to England. The Romans took stronger species like spearmint there. In Andalusian cuisine between the 11-13th C. mint was used to form part of an optical illusion and to enhance flavor. Spaniards added mint to sauces, eggs, eggplant and other vegetable dishes, seafood, poultry and meat. It has been added to jelly and brine for pickling. The English do not seem to call for mint as much only using it in salads and sauces, see lechazo. It is said that Greeks used mints in different perfumes for each part of the body and applied it to the under arms. Mints were used like toothpaste to whiten teeth and eaten to correct bad breath. Apple mint is particularly recommended to relieve wasp and beestings. Further, mints were used to relieved sore gums. Children’s heads were washed with it to prevent sores. 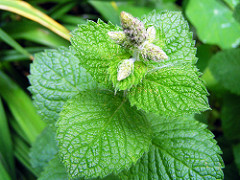 Mint was thought to relieve nausea, vomiting, colic and hiccoughs and to stop lust and bleeding. It is an antispasmodic. Traditionally it was a strewing herb for its fame in keeping pests away. Seasick travelers wore wreaths of it to relieve dizziness. Since ancient times, women consumed mint to end pregnancy. 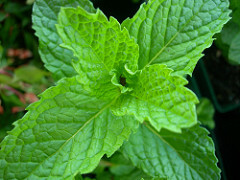 Recently it has been discovered that mint contains pulegone, a substance which does that. The Anon Al-Andalus prescribes a mint syrup to liberate the body of phlegm, phlegmatic urine, to fortify the liver and stomach and to create a happy state of mind. 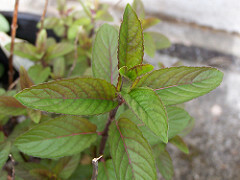 A recipe for a mint electuary is provided to stop vomiting, reduce the phlegm and to improve the appetite, to warm the stomach and if taken prior to eating, it acts as an astringent. A mint paste recipe is recommended to release heaviness of the mind and body, water retention in the ear and it dissolves the phlegm in the other parts of the body. It induces urination and stops vomiting. 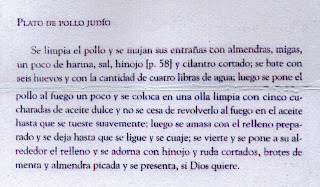 See blogs titled: beber, published February 2, 2012, and irake, published October 6, 2014, for mint syrup recipes; electuario, published May 2, 2014, for mint paste; and confitura, published January 7, 2013, for a mint electuary. Also see gallo cresta, hisopo, poleo, sándalo maqasiri, teuerio amarillo. 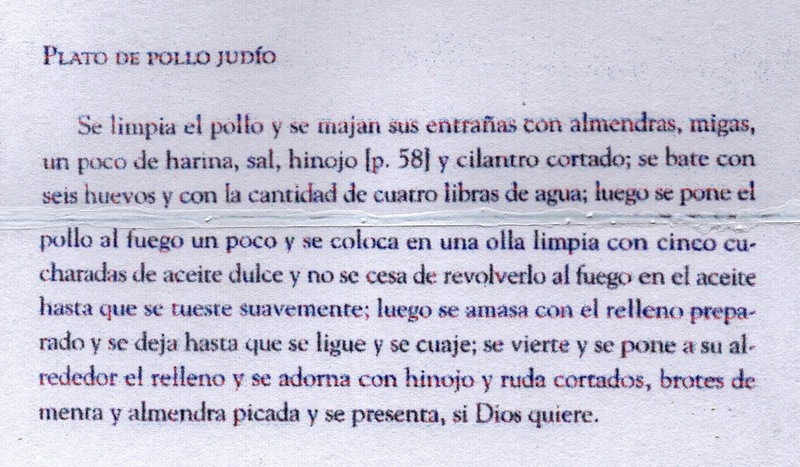 A JEWISH DISH OF CHICKEN ADAPTED FROM HUICI’S TRANSLATION OF ANÓN, AL-ANDALUS #110 PLATO DE POLLO JUDÍO, pp 75-76. A little buddy begging for mint! Remove any remaining feathers and wash chicken. Set aside. Put the remaining ingredients, except the oil, in a food processor. Grind until all throughly mixed. Singe chicken. Put it in a pot with oil. 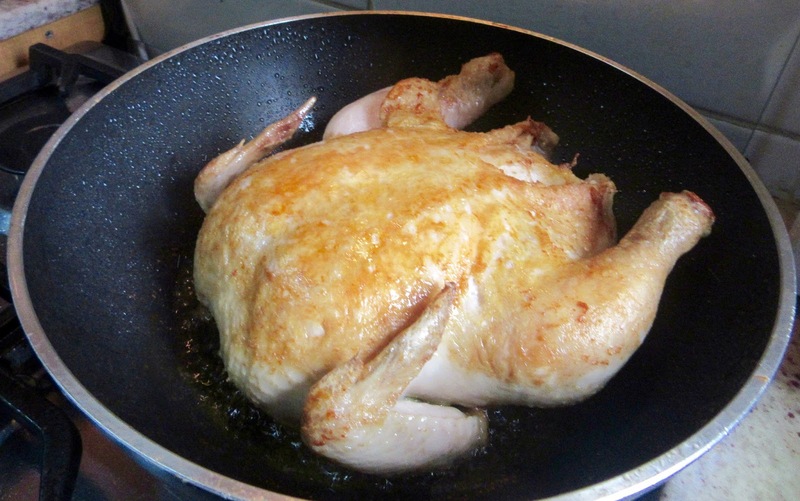 Turn constantly until lightly browned. Then cover with contents of the food processor. Leave pot uncovered. Cook until the egg mixture curdles and sets. 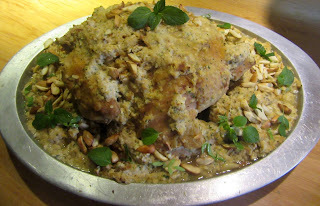 Place chicken on a serving platter and surround it with the egg mixture. Garnish with ingredients indicated above. If God so wills, present it. As it was out of season when making the recipe, 2 tsp fennel seeds were added instead of stalks. 1 ½ qts were added as the pot was not big enough for two qts. or cook in a double boiler to avoid curdling; either way is equally delicious.